Every year in the Grampian Area the Scottish Fire and Rescue Service deal with approximately 827 fires in the home, of which 122 result in injury or death. Smoke alarms are the first line of defence against fire. They are designed to detect fire in its early stages and can give you those precious few moments to get out safely. 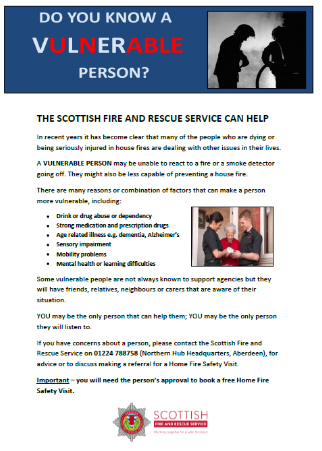 The Scottish Fire and Rescue Service can provide a free home fire safety visit, and if required, provide and fit a free smoke alarm, including smoke alarms for the deaf or hard of hearing. This safety check is carried out by firefighters from a local fire station, and will take approximately 20 minutes. They will look at all areas of fire risk within your home, fit smoke alarms where necessary and advise you on their maintenance. They will also give advice and information on how to stay safe from fire, including kitchen hazards, candles, heaters, electric blankets, safe disposal of smoking materials and the points to consider when making a home fire escape plan. Download the Home Fire Safety Visit leaflet for more information and for a phone number to get advice or to discuss making a referral for a Home Fire Safety Visit. The service already receives information regarding some higher risk members of the community, coming through as referrals from partner agencies. The main objective of the new campaign is to identify those who may be vulnerable to fire who may only be known to a neighbour, friend, relation or work colleague. To arrange a FREE home fire safety visit and to get more information and advice on Home Safety go to the Scottish Fire & Rescue Service web site.